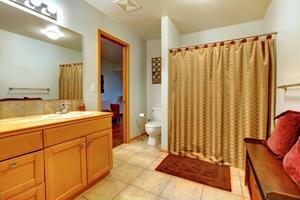 We've said before that maximizing your bathroom decor needn't be an arduous process. In addition to the easy, low-hassle methods of making going to the bathroom and even nicer experience that we've already pointed to, a handful of other experts have shed some light on kicking the state of your bathroom up to the next level. More than a dozen quick hints are included on StyleAtHome.com, and its ideas are geared towards individuals who'd like a bathroom that looks nicer, but don't want to leave a larger carbon footprint in the process. They're almost all straight forward: new mats and towels or wallpaper might at least provide for an overdue change of scenery. The same effect can be brought about by a fresh paint job or a new shower curtain for those who are pressed for time and money. The source also offers some somewhat more specific advice. Maybe you're considering installing a whole new bathtub, but all that might be necessary to make it feel like new is a round of grout cleaner. In terms of painting, StyleAtHome.com says that the color of the ceilings should be significantly lighter than the walls. This creates an ambiance that feels more like being outside, which would be especially great for small bathrooms that might feel a little cramped otherwise. RealSimple's advice could be called a little more "outside the box." The first thing on that source's list includes taking a spare nightstand and using it as storage in the bathroom. If you've got a bed sheet you're not using, consider turning it into a sink skirt. You don't see a lot of those around these days, but admittedly, a sink skirt could discourage children and pets from getting access to cleaning products stashed under the sink. It could even double as a large washcloth, if you're so inclined. Objects normally found around the kitchen could also find a second life in the bathroom. RealSimple points to sugar bowls as containers that could also be used for soap and might be more decorative than typical soap dishes. Both sites point out that scented candles never hurt if you're trying to cover up odors or simply create a more therapeutic atmosphere in the bathroom. Like many other online resources, both RealSimple and StyleAtHome encourage readers to keep their toiletries organized.